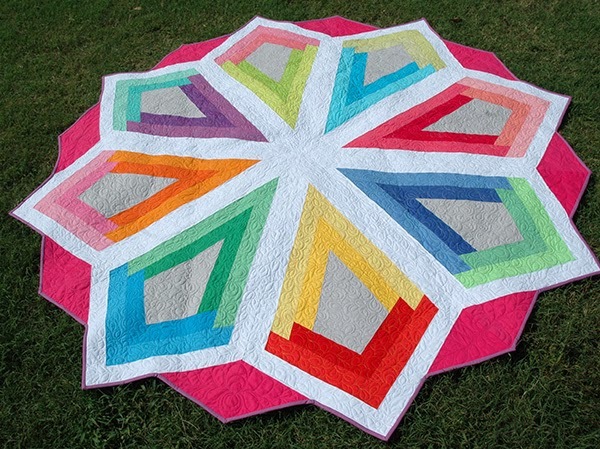 I thought of it as a painter's wheel with the Kona representing dabs of paint, but it is a log cabin quilt in disguise! 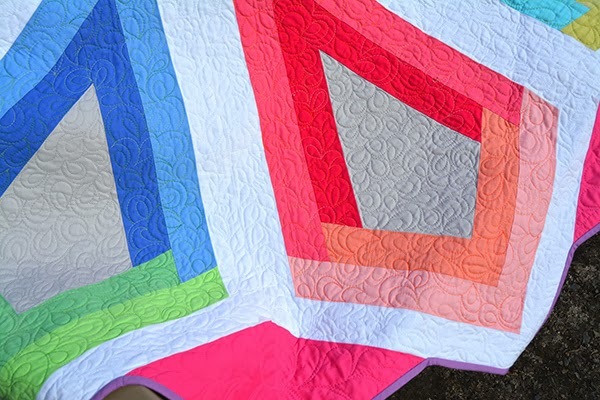 This is one of the quilts that I can't wait to see in other palettes or even in prints! C&T photographed it against a matching seafoam green. Nothing like decorating to match out quilts, right? It should always be that way rather than the other way around! One thing I learned the hard way is that you should ALWAYS use your template to line things up when trimming an irregularly-shaped log cabin. Don't just use your ruler edge. Ask me how I know! Deborah Norris did a spectacular job quilting this - she used white coordinating colors on the blocks themselves. I like how the loose floral motifs contrast with the angular lines of the piecing. 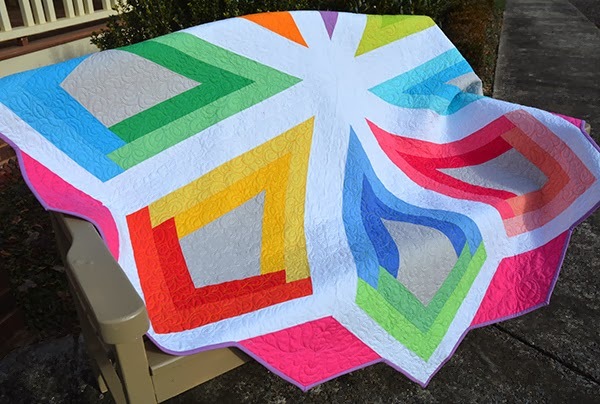 Make sure you head over the the Sew We Quilt Color Me Kona blog hop to see all the colorful projects popping up! Just lovely Amanda!! I am hoping to win this book somehow...lol the colors you used are fantastic and the paisley quilt pattern is a great one. This is my favorite... I am in the blog hop on Monday, so come by. There are a lot of corners to work the binding around, but what fun! Just beautiful! I had a hard time picking what I wanted to make from your book. 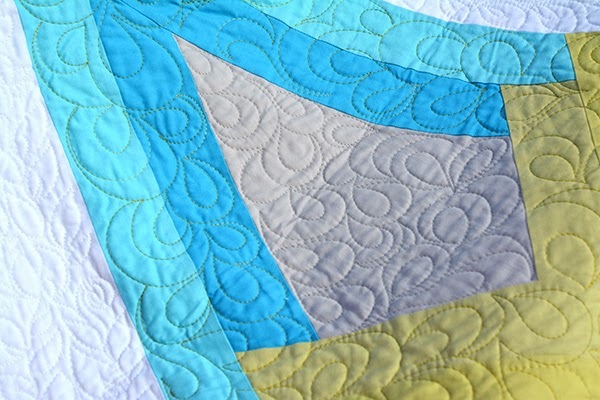 Your patterns and Kona=quilting bliss. So Pretty Amanda! Few quilts make me stop and comment. You NAILED IT with this one. Bravo. Just stunning!!! Sure brightens up this dreary day! Simply gorgeous Amanda! I LOVE all the color. I almost made that one Amanda. You have know idea how hard it was to choose a favorite to make for the hop...I loved them all ! Wow! I just love this quilt. It is going on my bucket list. Very beautiful design and quilting! 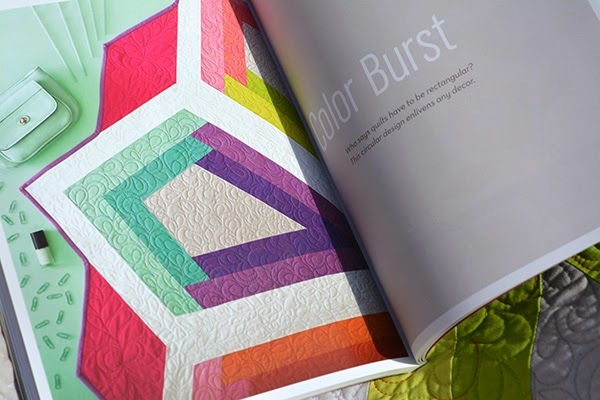 I love Your Color Burst quilt, Amanda! This is one of the most beautiful modern quilts I've ever seen.